THIS TRIP IS SOLD OUT! THANK YOU FOR YOU INTEREST AND SUPPORT! When: Friday, July 20, 2018, rain or shine! The building of the new bridge over the Tappan Zee has been among the largest infrastructure projects in the United States. Since 2014, the HSRC has been thrilled to offer exclusive opportunities for people of all ages to see this important undertaking from a unique, on-the-water vantage point. Seniors, adults, children -- all are welcome to join us on the Mississippi-style paddle wheeler River Rose for what will be our final cruise to the Tappan Zee bridge construction site. 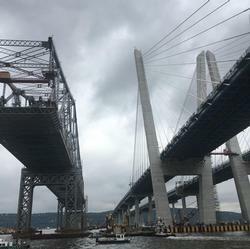 Participants will see dismantling of the old Tappan Zee Bridge and final construction phases of the new bridge from viewing points as near to the bridge as are LEGALLY and SAFELY possible. Narration and commentary will be provided by historians from the HSRC, as well as by leaders of the current bridge project (availability and conditions permitting). These guides will also be available to answer questions you have about the past, present and future of the bridge over the Tappan Zee. The "Tappan Zee Bridge Experience: Past, Present, and Future" boat trip series received a Greater Hudson Heritage Network AWARD FOR EXCELLENCE in 2017. Tickets can also be purchased using a credit card by calling the Historical Society of Rockland County at (845) 634-9629. From Palisades Parkway: Take Exit 15, direction, Stony Point. Go 3 miles to Route 9W (T junction). Go left, or north, 1/4 mile to traffic light. Go right on East Main Street. 1 1/2 miles. From North: Take Route 9W South to traffic light at Stony Point. Go left on East Main Street, 1 1/2 miles. From South: Take Route 9W North to West Haverstraw. Go right after Samsondale Plaza on Railroad Avenue for 1 3/4 miles. Follow signage for parking and dock. Cancellation policy: Due to the overwhelming popularity of these trips, refunds will be given only within seven days of purchasing your ticket. A waiting list will be compiled, and available spaces will be filled on a first come, first served basis. Only those who have made full payment can be accommodated.